This is my fugly 15 year old house. We are planning a lot of internal changes for later this year and while we're on we'd like to have some kind of external porch put on. Trouble is we're so close to the cul-de-sac road and have such a tiny front garden, so it can't come out too far. The garage is going to become a small single on the opposite side of the front door, and the garage will be converted and have 2 windows to match the bedroom above. The front will all be block paved or that new resin stuff laid when we're all done. The front door is currently inset (not sure of the right wording) and some people with the same style house have just put another front door flush with the front brick work, that doesn't look good, so I'm thinking we need to come out a little bit. We seem to be in a wind tunnel, my Hoover is never away as bits blow in as soon as you open the door and as it's a good size hall I'm fed up having to hoover it umpteen times a day! 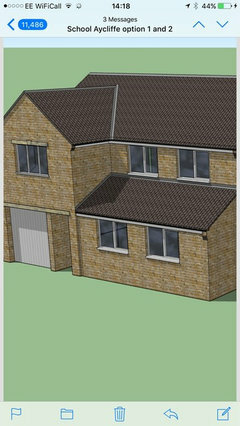 So, would an external porch look daft? If not, any ideas of styles oh brilliant houzers? When are you planning to implement the internal changes? How about a new canopy to mirror the apex roof like a triangle? Could you incorporate some sort of hallway/utility/boot room as a substitute for a porch? @isandyh I agree about the tiny porches! At the minute the tiled bit before the front door is about 1m deep and 1.5m wide (I will actually measure this when home later as I should know), so I wondered if coming out another 80cm or so would make it big enough? 80cm is about how much the silly canopy stands proud now actually. We have a really long good hall with storage and radiator covers for dressing etc so space inside is fine, and we will have a utility when we do the internal bits. I’m thinking if you made the porch as wide and as deep as the existing porch roof, you would have enough room to come inside and close the door before opening the existing front door, thereby solving the whirling mess problem and further insulating the house. There would be room for a brolly stand and for wellies. I think that's pretty much all I'm after Diana really, even if shoe storage is still in the hall or utility that's fine, it's just to have that extra barrier between outside and a lovey hallway. Do you think it would look odd though? 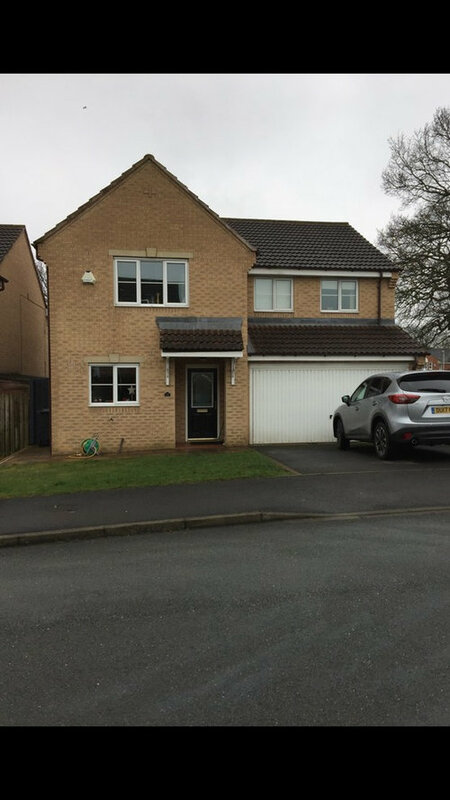 Thank you celerygirl, I think something like the first picture would have been ideal if we had the space at the front to bring both the garage and porch forwards a bit but I'm afraid the front is too shallow before the footpath/road. It would have given me a wider utility too so it's a shame that wouldn't work. Does anyone have any images of something small that may look ok stuck on the front of this house - I'm struggling to find images of porches that are small enough? Thanks Jen, the current garage isn't set back, it's all just straight across the front, there's like a half brick lip which maybe making it look set back. This is a picture of switching the garage door to the other side, minus a porch or canopy or anything. 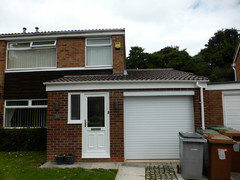 The garage door was specified after this image was done and the builders said we can have a smaller single door. It's still classed as a single (we only need it for a bike storage and a motor bike). It's going to look great how exciting. 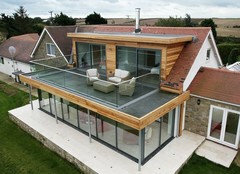 I still personally wouldn't have a porch (although I love them for practicality!) 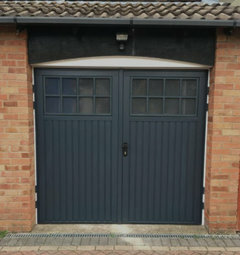 but would go for an attractive garage door like this, and keep a dyson cordless in the hall! Sorry for late reply...I don’t think it would be odd at all. You’re clear about what you want and why..it’s the simplest, cheapest solution to your problem. Thinking outside the box (! ), how about a low (not high like a typical hedge) row of box or ilex along the edge of the grass in front of the house (next to the house, rather than on the road side) which would help to reduce the impact of the gale you mentioned? My thought would be to install a heritage type garage door painted in one of the currently very popular chalky colours with the front door in the same colour to keep the front of the house appealing and not “flat”. I agree with the post above about planting a small hedge at the edge of garden. I think you would have to be very careful about adding a porch for the reasons already mentioned. Have you discussed this with your architect? They come up with all kinds of innovative solutions to issues like this regularly. Ah thanks guys for the hedge idea, we should have done that years ago! But now the garage is moving sides there won't actually be any garden on the new plan to hedge! It will all be blocked or the new resin product. We need to be able to drive a motor bike into the garage and the parking has always been tight for two big cars so we're just doing away with the grass and will use external lights and planters to soften the exterior. I like the idea of a nicer looking garage door, hubby needs an remote roller one so he doesn't have to get off the bike and open the door and get on again to park it inside - so I'll start looking to see if you can get anything roller like that's not too unattractive. Need help on style of porch and front door! Tiling an external corner to different heights...URGENT HELP! Need any help with bespoke veneered internal and solid external doors?